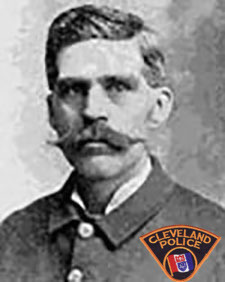 Patrolman Walter C. Chapman was appointed to the Cleveland Police Department on June 19, 1886, and was considered by his fellow officers to be a well-liked officer. Chapman was assigned to the Fifth Precinct but had been recently transferred to the Third Precinct to work strike duty for the garment worker’s strike. On August 22, 1911, at 9:55 p.m., Patrolman Walter C. Chapman was shot in the back and instantly killed when a .38 caliber bullet pierced his heart. The fatal shooting occurred in Decatur Alley located to the rear of 2237 Orange Avenue. After being shot, Chapman fell to the ground and died in the dark alley a few feet away from the rear of the Perry Theater. Conditions at the scene indicated that Chapman had been taken completely by surprise and had been shot down before he could draw his weapon. On the night of the shooting Chapman and his partner, Patrolman Robert Clark, were assigned to duty in the area of Decatur Alley to guard a number of women who were employed at the various cloak factories from harm at the hands of strike sympathizers. The alley had been the scene of several recent disturbances and was being watched closely by police. Upon hearing shots, two nearby policemen, Patrolmen Clark and Manning, rushed to the scene and found Chapman’s body. Patrolman Manning ran around the corner to Louis Cohen’s Saloon at 2135 Woodland where he called for an ambulance and notified headquarters of the murder. Later examination of the body revealed that only one of five shots fired struck Chapman. Unfortunately, that one bullet had pierced his heart. The Cleveland Garment Manufacturer’s Union offered a thousand dollar reward for information leading to the arrest of the murderer. On June 19, 1911, Patrolman Chapman had completed 25 years of service as a Cleveland Policeman. Although eligible for retirement, he never gave a hint to fellow officers that he was considering retirement. Chapman was the ninth Cleveland Policeman killed in the line of duty. His murderer was never apprehended. Walter C. Chapman’s name is inscribed on the National Law Enforcement Officers Memorial Wall, Washington, D.C. panel 53, west wall, line 17. By Lt. Edward F. Lewis, Bay Village Police Dept. GCPOMS is a registered 501(c)(3) charity. Donations are tax-deductible. The Greater Cleveland Peace Officers Memorial Society™ Inc. (GCPOMS) is incorporated in the State of Ohio and approved as a 501 (c) (3) non-profit charitable organization by the U.S. Internal Revenue Service. Donations to the GCPOMS are tax deductible as allowed by the IRS. All rights reserved. 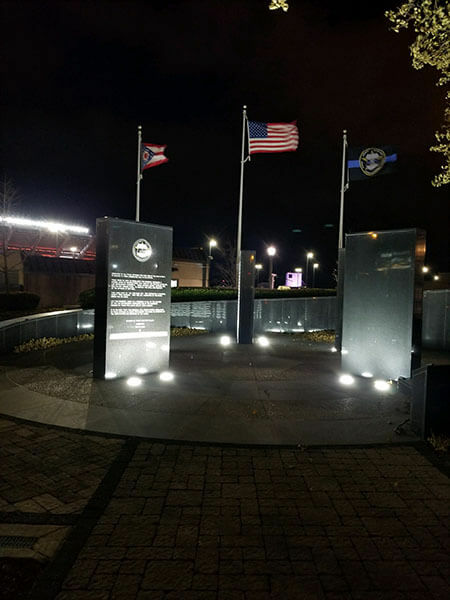 The GCPOMS' name, motto, logo, images, including the Greater Cleveland Peace Officers Memorial (GCPOM) are the exclusive property of the GCPOMS, are registered, and their use in any way is prohibited without the express written consent of the GCPOMS President or Board of Directors. This includes any use of the GCPOM, including but is not limited to use as a backdrop in any video, photos, electronic or printed material, or as a venue for any special event. The GCPOMS can be contacted via email at info@policememorialsociety.org, or by calling 216-337-3537. Copyright © 2017 by the Greater Cleveland Peace Officers Memorial Society™. All rights reserved. No part of this website may be reproduced, copied, transcribed, or otherwise distributed in any form, format, or by any means without the prior expressed written permission of the Greater Cleveland Peace Officers Memorial Society™, the copyright owner.